Synopsis (via Goodreads): This irresistible first novel tells the story of a quiet boy who embarks on a dangerous quest in order to fulfill his destiny -- and find his father -- in a strange world beneath New York City. You know a book is good when it can make you like cockroaches and spiders. I actually wanted to hug a cockroach and feared for its life! 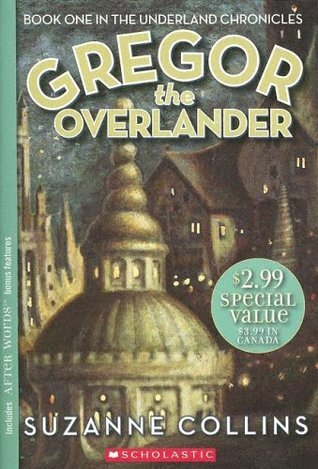 I would love to tell you that Gregor the Overlander has forever changed my heart, but sadly it has not. Cockroaches in real life still make me jump onto the nearest piece of furniture, or run screaming in the opposite direction. The first few times they're mentioned in the book, my skin literally crawled. Even thinking about them right now is giving me gooseflesh, because they were giant cockroaches that you could ride on. However, Temp and Tick will forever hold a special place in my heart. They treasured Boots and kept her safe (Boots is Gregor's two-year-old sister and my favorite character). She didn't judge them or think they were gross -- she loved them for who/what they were. Boots always remembered to include them in meals and was constantly concerned with their well-being. The others, like me, thought the Crawlers were creepy and kept their distance. In the end, they won me over with their kindness and selfless personalities. I've never been afraid of bats or rats, but this book gave me a new appreciation for them. It's crazy how a different perspective can alter years of thoughts and feelings. I really enjoy books with prophecies! It's one of the reasons I like the Percy Jackson books so much. They always start with a prophecy, and it's fun trying to piece the information together on my own. The majority of the time things don't click into place until they happen, but the journey is enjoyable. I have a feeling this series will revolve around prophecies as well (yay!). Like I said before, Boots was my favorite. She's two and Suzanne Collins captured her personality perfectly. Children (especially at that age) are not immediately afraid of things. They are trusting and view the world with an open heart. Boots was no exception. She quickly formed a friendship with the Crawlers and didn't hesitate to befriend anything or anyone that came her way. I loved the innocence Collins was able to portray through Boots, and how her personality often helped them accomplish their goals. Gregor was also an enjoyable character and took wonderful care of his sister. He didn't always have the tools he needed, but it was obvious he loved her. He would risk his own life, even being a child himself, to make sure she stayed safe. He carried her on his back without complaint just to keep her close. Gregor was also quick on his feet and easily adapted to new situations. He took everything in stride and tried to find the best path for him and his sister. Gregor the Overlander was a phenomenal story! I was reading this to my son at night, but would keep turning the pages long after he'd fallen asleep. I'd allow myself to read one more chapter (re-reading it to him the next day), but once I reached a certain point I couldn't stop. I needed to know what happened and how the story ended. I'm really happy with the conclusion -- hopeful and final -- and cannot wait to read the rest of this series! Woa, hug a cockroach! Insane! How does she pull if off?! Haha, it's completely insane! However, they were some of my favorite characters throughout the book. <3 It takes some series skill to make cockroaches friendly and likable. My thoughts exactly! I know you prefer adult romance with the occasional YA, but if you're ever looking for an awesome MG -- this is it. It's truly a remarkable story that I immediately fell in love with. When I first read this book I had to take a moment to gag at the mention of giant cockroaches. This book series is SO good! I love it! I owned this book for awhile, but I never did get around to reading it. I think I'm worried that I'll like it a lot less than The Hunger Games and I want Suzanne to stay perfect! XD I'm glad you loved it! I was also taken by surprise with some of the plot twists at the end, and the prophecy wasn't at all what I expected. It will definitely keep you on your toes! I think you'd really love this one, Jenny! Haha I'm not sure I would ever want to hug a cockroach, but then again I've never read this book! I've been back and forth on whether to read Suzanne Collins's children books. I mean, I'm not a child and my daughter isn't old enough for these types of stories. So, maybe I'll wait until she's older and I can read it to her. But, by the sounds of it, maybe I would just like it anyway, considering you kept reading after your son had fallen asleep! Nah, no need to wait! Yes, I did get this to read with my son, but now that I have... I'm totally speeding through the rest on my own. I'll re-read them to him later! It had such an addicting story, and I cannot wait to dive back into the world Collins has created. Sold! This sounds wonderful Lindsi. I haven't read an MG since my kids did, but I want to grab this for the Royals. It was an MG that didn't feel like an MG. There's so much suspense and mystery surrounding the Underland and their quest, so it didn't take long for me to get sucked into the story myself. I think anyone you grab this for will fall in love with the story. I'm itching to get the next book myself! i always forget suzanne collins has written anything bar THG even though i see this series at work often it always surprises me each time. its like i have serious memory loss just for this series. im v glad you (and your son) enjoyed this! I think a lot of people forget she has other books! Like, J.K. Rowling has other books, but she'll always be known for Harry Potter. If you enjoyed The Hunger Games, you should definitely try this one -- especially if you see it at work all the time! I always like a good prophecy. And ditto about cockroaches- ugh. They should NOT be in stories lol! I do like the idea of a secret world underneath nYC though- I'm always a sucker for that concept. And is this the Hunger Games Suzanne Collins?? I had no idea! Yes! She also wrote The Hunger Games, but I might actually like this more... is that terrible to say? I immediately fell in love with Boots and thought the Underland was marvelous. They're away of Overlanders, yet they are unfamiliar with a lot of things. You know what... I never even knew she wrote books other than THG. I never checked. Crazy. This looks really cool, actually. Honestly, I might not have been as interested if it wasn't by SC. But knowing that makes me curious. This is a great review and I want you get this book too - although cockroaches are definitely not my thing! Haha, they're not my thing either! I usually let my husband deal with them if one happens to get inside. If he's not here... I try to find a shoe, but now I might try to sweep them outside. Maybe. I really liked this whole series when I read it years ago. Glad you guys are enjoying it!! Yes! We're both looking forward to the next one! I'm reading the second Harry Potter to him right now, but will probably jump back into the Overlander series when we're finished. I'm happy you liked it, too! It'll make you like cockroaches and spiders. Well, I like spiders but not roaches. lol That's hilarious. oh gosh, I can't handle cockroaches and spiders. I don't mind rats and bats though. LOL I'm glad you're enjoying this. Sounds like a fun read! It was a blast! I hope the rest of the series is just as wonderful. I think I've heard of this one a few times... Though not as much as her Hunger Games. I feel like most MG books don't get as much attention as others. There aren't too many adults that read them, and so few bloggers include them on their blogs. There are a few, I know, but it's not the majority. I only started reading more MG when my son was old enough to enjoy the stories. However, I'm finding that he MG genre has some really incredible books to offer! They've been some of my favorite reads this year. The Crawlers were awesome! Temp and Tick were so kind and generous. Oh wow, I can't even begin to imagine a book that would make me like cockroaches so now you have me very curious! Haha! I think everyone is focusing on the Crawlers. Although, I understand likeable cockroaches isn't something you hear every day. I think Collins did a good job of conveying people's disdain for them, but also showing how important they were to the story. They were kindhearted, shared their food with Boots if she was still hungry, and offered to let her ride on their backs if she was tired. They were selfless creatures that like to keep to the shadows, but left their comfort zone because they were needed. It's so endearing when kids love ALL animals, you know? I met up with an aunt in Canada, and her daughter wouldn't let their dog stay in one room--she says it's torture. She also leaves food outside for the visiting deer and rabbits. xD I'm DEFINITELY forever scared of cockroaches, but this book sounds so charming and I'm intrigued! I remember wanting to read this back when I got addicted to The Hunger Games! I enjoyed this as an adult, so I think it's a great book for everyone! There are a lot of important messages conveyed throughout the story, and I loved that Boots was part of the journey. She trusted and loved without question -- it just came naturally to her. I hate that we lose that as we get older. There was another saying that really stuck with me... "Courage only counts when you can count." (I think I got the wording right.) Boots seems fearless because she doesn't know she should be afraid. Once people are more aware of themselves and the world, doubt and fear creep in around the edges. I love the Hunger Games trilogy and have always wondered if I would like her other books. This review makes me think I would. I am going to have to give this one a try, Lindsi! I enjoyed The Hunger Games, too! There were a lot of deaths I didn't agree with, and Collins isn't afraid of killing people off in her MG series either. Even the prophecy says 12 will embark on a journey, but only 8 will return. It's hard not to get attached to the characters, so I'm always destroyed when someone dies.